You cannot simply imagine the havoc that microscopic allergens hiding deep inside the carpets of your offices can cause to your employees who have dust allergies. Yes, dust mites and other allergens, despite being invisible to the naked eye, can trigger allergic reactions in people, such as wheezing, rashes, coughing, stuffed nose, and rhinitis. Dust mites, pollen and dander are blown inside along with the dust and get stuck inside the carpets. Furthermore, dead skin and tiny food particles also seep inside the carpet. All of these particles provide a perfect habitat for the dust mites to burgeon and thrive. The dust mites also create an enzyme to feast upon these particles, which when coupled with the dust mite faeces and dust mite corpses, create an unhealthy environment for the people breathing the same air. 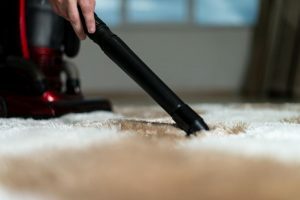 Vacuum cleaners help in eliminating dust particles, and the allergens clinging to the carpet fibres from your workplace. Continue reading to find out why it is so important to keep the air quality inside your offices dust-free. You would not want to deter the performance of your employees at any cost. But, if you do not keep the carpets in the workplace clean, you would end up staking the productivity of the subordinates and colleagues. Obviously, the employees will take medical leaves if a severe reaction takes place. They will have persistent headaches, clogged nose, and cough, which will impact their work performance. It is not just the employees who will suffer from unclean carpets. Your vendors, business partners, and customers as well who come to the office will also interact with you in the same environment. You wouldn’t want them to leave getting a poor impression, and eventually falling sick, would you? By cleaning the carpets of your office regularly, you will help in preserving the assets. If you want the carpets in the workplace to endure the test of time, you will have to make use of efficient cleaning products and proper usage of vacuum cleaners. Should You Minimize Carpeting in the Workplace? Numerous people suggest that carpeting should be minimized in workplace in order to cater to the needs of allergy sufferers, and supplant the carpeted floors with hardwood floors. On the flip side, carpeted floors may just be better at trapping the allergen within the fibers rather than allowing them to circulate around in the office environment. However, now you will have to take extra precautions. The carpeted floors will have to be vacuumed regularly to pluck out the allergens holding on to the carpets in the workplace. You do not have to feel guilty about having carpeted floors in the office as long as you have proper cleaning maintenance routines. The high traffic areas in the offices should be vacuumed thoroughly at least twice a week. If employees are allowed to bring their pets to the office, you will need a more rigorous maintenance cleaning schedule. Also, keep in mind that you will have to clean the upholstered furniture, drapes, walls, and the ceilings alongside the carpets with a vacuum cleaner. Extra Hands Services provide expert commercial carpet cleaning services so that you are able to maintain a safe and healthy environment in your office.